In 2009, Malaysian Prime Minister Najib Razak established a sovereign wealth fund called 1Malaysia Development Berhad (1MDB) to help the country attract foreign investment and boost its economy. Long story short, by 2015, 1MDB owed investors $11 billion. As investigations of the state fund got underway, it was revealed that $681 million dollars had been deposited into Najib’s personal account. The prime minister copped to the money transfer, but claimed it was a “gift” from the Saudi royal family, about $620 million of which he says he has returned. 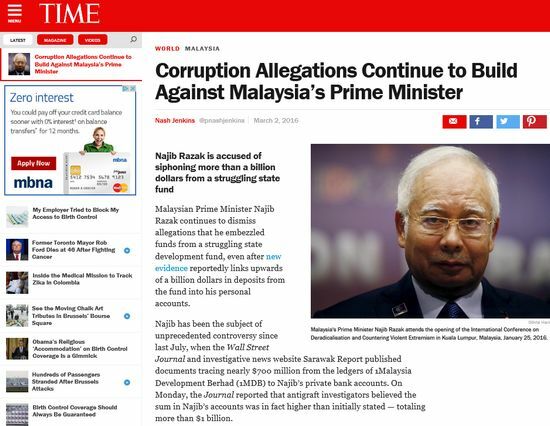 Two weeks ago, the 1MDB investigation uncovered that the total routed into Najib’s personal account was actually about $1 billion. …a series of overseas investigations into the Malaysian money trail, including one initiated by the F.B.I., are still pending. …Most Malaysians have resigned to the fact that corruption is a systemic problem but the quantum of the 1MDB allegations has shocked everyone. That Time mentioned Malaysia at all, and compared it with Brazil, South Africa, China, and Russia? That’s not a ranking or inclusion that generates confidence.